This last one is a collection of contiguous 3D Polygons which share some edges and describe a 3D volume. A TIN is a POLYHEDRALSURFACE where all Polygons are Triangles. This TIN describes a tetrahedron. It's possible to create some 2D TIN or POLYHEDRALSURFACE but their main aim is to describe 3D volumes. It's not possible to create TIN & POLYHEDRALSURFACE with Multirings Polygons. It's in their mathematical definition, faces of PolyhedralSurfaces can't have holes. I'm a student of Geodetic & Geomatics Engineering, Gadjah Mada University, Indonesia. I have been working in my final project (minithesis) about 3D spatial database design for my bachelor's degree. I am interesting in your blog (http://postgis3d.blogspot.com/) about user-defined function to create polyhedron & TIN type in PostGIS. I have installed latest version of PostgreSQL & PostGIS on my windows successfully. 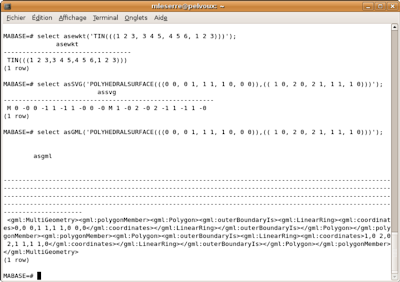 I want to use polyhedron & TIN function, but I think there are no such functions in my PostGIS. Could You tell me the full code (or literatures) to create these functions, please? Could you give me tutorial to create and use your TIN and PolyhedralSurface on Windows, please? the same question with Febri, would you please send me your sql script of creating the function and new data types, thank you very much! It is a great help for me.